Conference club Cambridge United have approached former Dundee manager and Chelsea coach Jim Duffy to become their new boss. Duffy has confirmed to BBC Sport that he has held talks with the Cambridge chairman Lee Power and has asked for 24 hours to make his mind up. But it appears unlikely that the former Hibernian manager will be prepared to head back down south at this time. 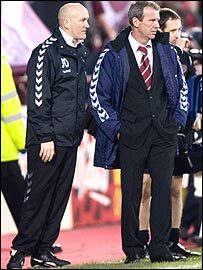 Duffy was director of football at Hearts for a spell last season.